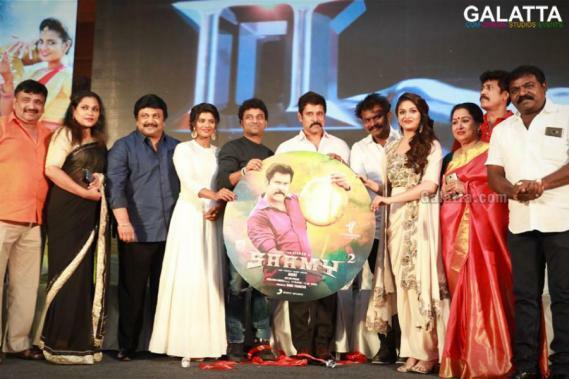 It was a gala affair yesterday (July 23) as the audio for the upcoming action film, Saamy Square, was launched amidst much fanfare. Starring ‘Chiyaan’ Vikram, Keerthy Suresh and Aishwarya Rajesh in lead role under Hari’s direction, Saamy Square features music by Devi Sri Prasad under the Thameens Films banner and is at present being planned for a September release as per latest reports. Meanwhile, it has now been announced that a lyrical video for the song “Pudhu Metro Rail” sung by Vikram and Keerthy Suresh in Saamy Square will be released today evening on YouTube. The “Pudhu Metro Rail” track looks to be a peppy track and will no doubt be a delight for fans until the time of the film’s release.